Freddy Krueger, Jason Voorhees, Leatherface and Michael Myers. The four most terrifying names in horror come together at this year's Halloween Horror Nights at Universal Studios Hollywood as the silver screen's extreme serial killers bleed into a trio of all-new slasher-themed mazes, beginning Friday, September 16, 2016. 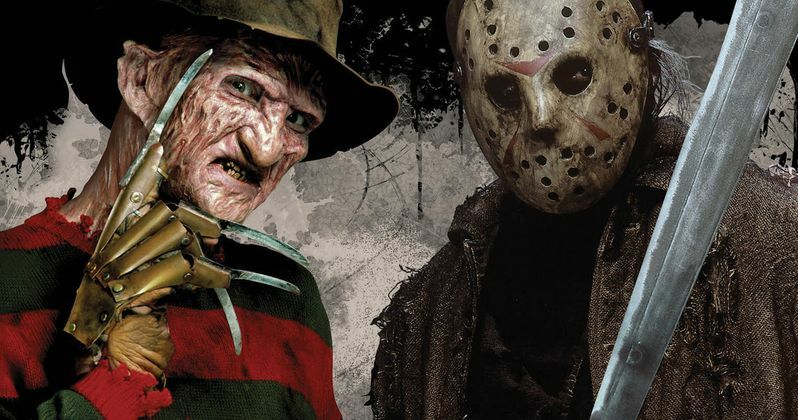 In Freddy vs. Jason, demented killer Freddy Krueger (A Nightmare on Elm Street) returns to the scene of the crime, this time accompanied by notorious hockey mask killer Jason Voorhees (Friday the 13th) to inflict twice as much terror. Inspired by New Line Cinema's 2003 film that brought together the biggest horror icons in history, this new experiential maze thrusts guests into an epic battle in which the fate of only one killer will survive. The unspeakable terror embroiled within The Texas Chainsaw Massacre: Blood Brothers|strong maze, based on Tobe Hooper's original film, will pit guests against the unsavory wrath of the demented killer, Leatherface, and his mentally unhinged brother, Chop Top, as they unite in misery to expand the family's cannibalistic enterprise and slaughter a new generation of innocent victims. With the perverse duo at the helm of a grotesque BBQ restaurant staged inside a dilapidated roadside gas station, unwitting guests will soon realize that new terror awaits as the blood brothers continue their hedonistic prey on human flesh. Escaped mental patient Michael Myers makes a homecoming return in Halloween: Hell Comes to Haddonfield|strong, an all-new maze inspired by the second film in the classic "Halloween" horror franchise. Echoing the infamous words uttered by the film's Dr. Sam Loomis, "You can't kill the Boogeyman," the twisted maze will shed new light on the terrifying lunacy of Michael Myers as he scours the streets of Haddonfield and stalks the halls of Haddonfield Memorial Hospital in ruthless pursuit of his victims. Halloween Horror Nights 2016 at Universal Studios Hollywood kicks off on Friday, September 16, 2016. The popular event brings together the sickest minds in horror to immerse guests in a living, breathing, three-dimensional world of terror. Featuring an all-new slate of unrivaled film production quality mazes, frightful scare zones and a fully re-imagined Terror Tram experience uniquely themed to today's most definitive horror properties, "Halloween Horror Nights" will taunt, terrorize and torment guests with spine-chilling haunted attractions as part of Southern California's most extreme Halloween experience. The all-new The Walking Dead permanent attraction, based on AMC's hit show will further enhance Halloween Horror Night's terrifying lineup.